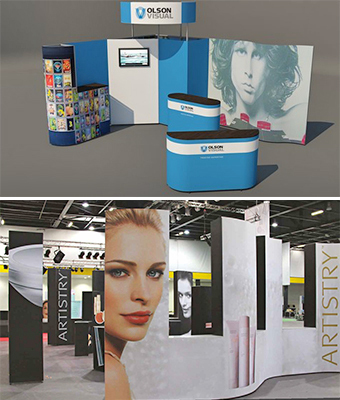 For exhibitions, mounted on foamex and attached by velcro direct to shell schemes or using a panel kit they provided a cost-effective eay to display images of products etc. In offices and reception areas, bespoke framed, inserted into a snap fram or mounted with wall mount sign supports they are a great way to display the work or your organisation. 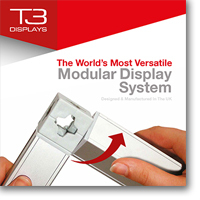 T3 Modular Systems change as the needs of your business change. 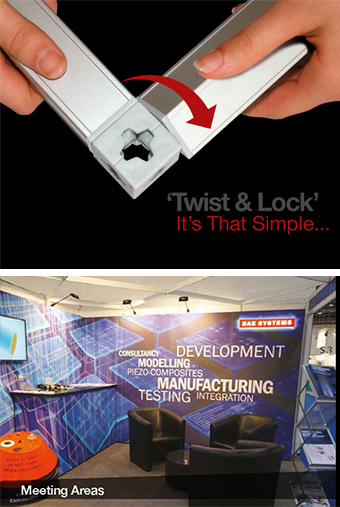 Create any configuration you need and scale it up or down to suit. Change the look easily with simple roll-on magnetic graphics or add fluorescent tubes to create a backlit booth. Turn a booth into a retail display by replacing your graphics with a veneer finish such as fabric, wood or brushed nickel. Reconfigure your booth into a stage or fashion runway for one event and back into a booth for the next. Lightweight shipping and simple, tool-free assembly will save you money; your sales team can set up the system themselves and it can be shipped at a fraction of typical booth shipping costs. This reusable, reconfigurable, modular system will also lower the environmental impact of your marketing because it uses components manufactured in the UK....so you will never need to buy another trade show booth again.